Senator Susan Collins (R-ME) says that she will join Democrats in voting to restore the net neutrality rules that the FCC voted to roll back last month. 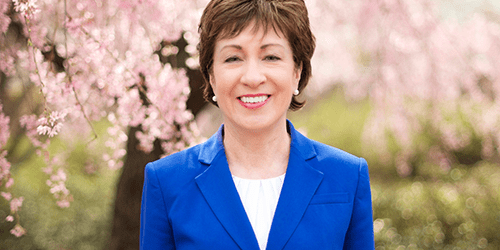 Collins announced her plans to The Hill. Her decision puts the reversal just one vote shy of passing the Senate, the first of several big hurdles for a long-shot resolution that Senator Ed Markley (D-MA) plans to introduce under the Congressional Review Act (CRA). The CRA allows Congress to overturn recently passed federal regulations with a joint resolution. Markley's resolution faces long odds, to say the least. Republicans have a majority in both the Senate and the House of Representatives (which would need to join the Senate in the aforementioned joint resolution). Just as with other acts of Congress, CRA resolutions are subject to presidential veto, and President Donald Trump would almost certainly kill the resolution if it made it to his desk. But by forcing a vote – something the Democrats can, and plan to, do with just 30 votes – Markley and the Democrats can force Republican politicians to go on record with their support of the policy. Republicans are probably not keen to do so. The FCC's controversial decision to do away with the 2015 net neutrality rules restored the internet's status as an “information service,” effectively freeing internet service providers to do things like throttle internet speeds for certain users or websites. That's not a popular idea: polls indicate that net neutrality enjoys the support of 83% of Americans – including, crucially, 75% of Republicans. Republican lawmakers would presumably prefer that voters' ire be concentrated on the bureaucratic FCC and its board members, and for the whole issue to fade from the headlines before this year's elections. They may not get their way. The looming vote may tempt more Republican lawmakers to join Collins in her trek across the aisle. If just one more Senate Republican flips, then the resolution will pass the Senate. While there's little reason to hope that the resolution would go further than that, passage in the Senate would put more heat on House Republicans and put net neutrality in the headlines yet again – and would constitute a political victory, if not a legislative one, for Markley and the Democrats. Susan Collins is Republican in name only.